A blender animation of a sculpted stick-man, animated with armature! In this project an animated stick-man has been realized in Blender! The requirements have been a stick-man moving in a precise way, with a particular motion blur. First of all the stick-man has been sculptured, and added the required an emissive material. 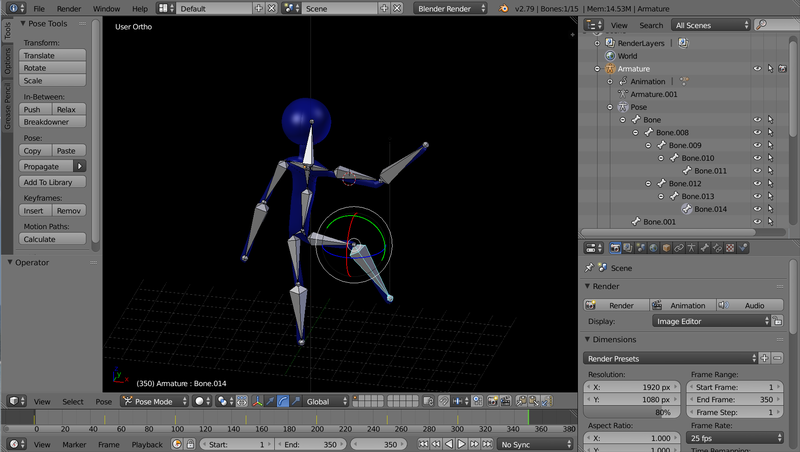 Once finished the blender sculpturing phase, the armature has been added. The armature is very easy, because the required movement is very easy. At this point, it is time to start the animation of the stick-man, at some precise frames the whole sticky-man keyframes added, to accomplish the required movement. Also the motion blur has been added. It is time to set-up the blender animation, setting the output parameters and so on..
Below you can see the results! The original theme was Relia (http://www.wprealia.com/en/) but I have made some modification. If you need some help you don’t hesitate to contact me! !